Introduction and Objective: Sandfly fever remains a significant health problem in many parts of the world (particularly in Africa, the Mediterranean Basin, the Middle East, Central Asia, and Europe). The aim of this study was to determine the latest circumstances of this disease at present in the world. Materials and Methods: Two methods were used to gather the information for this article. First, PubMed was searched for English language references to published relevant articles. Second, the term sandfly fever was searched on Google Scholar too. Results: In PubMed, 156 articles and in Google Scholar, 70,400 articles mentioned the term sandfly fever. The most searched items in PubMed were epidemiology, treatment, prevention, and life cycle with incidences of 41.66%, 20.51%, 13.46%, and 1.92%, respectively, and in terms of geographical distribution of the study, the maximum number of articles in PubMed were published from Europe, Asia, Australia, and America, with percentages being 26.92%, 17.30%, 17.0%, 1.28%, and 1.28%, respectively. Conclusion: Different countries have reported the disease either as an endemic or as an imported one. 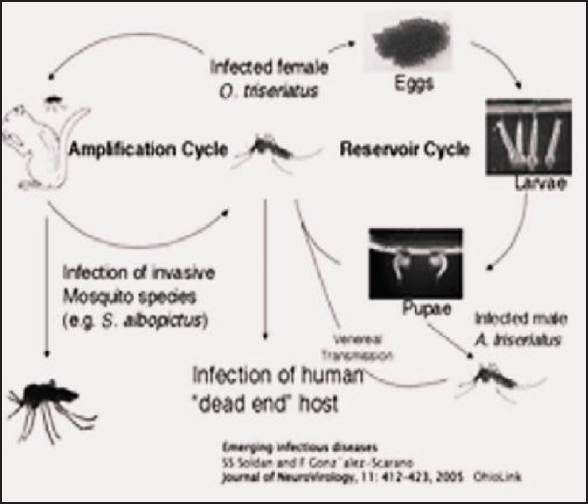 Further investigations on the pathology and virulence of ecology of sandfly fever are necessary to improve the understanding of this cycle in order to provide adequate preventive measures, and also to improve them. Oral cancer is one of the major threats to public health in developed as well as developing countries. Despite the current therapeutic modalities, which include the use of nonselective treatments (surgery, radiation, and chemotherapy), the mortality and morbidity rates still remain high due to delays in diagnosis and treatment. Thus, it is important to completely understand the molecular mechanism in the development of oral cancer to further develop more selective treatment. This review attempts to identify and understand the deregulated molecular pathways and related genes in oral carcinogenesis. Introduction: Tuberculosis (TB) data are used to evaluate the effectiveness of TB program interventions, identify deficiencies, and inform policies and programs. These data are also used for advocacy, resource mobilization, and allocation, both nationally and internationally. This study is aimed at verifying the reliability of the data collated and submitted from the direct observation therapy strategy (DOTS) facilities to the National TB Program (NTP) in some selected states in Southern Nigeria. Materials and Methods: A total of 29 facilities providing TB services were purposively selected from six states in Southern Nigeria, based on the treatment success rate as reported in 2009. In each selected facility, the following records were reviewed for concordance: Patient treatment cards and facility TB register, facility TB register and facility laboratory register, facility TB register and local government area (LGA) TB register, and LGA TB register and TB quarterly reports. Furthermore, a total of 273 patients were selected for interview to validate the information contained in the treatment cards. Results: Agreement between the data sources was relatively high, though higher in some states than the others. Agreement between patient treatment card and facility TB register, and facility TB register and laboratory register were 97% and 85%, respectively. The lowest concordance was observed between the facility TB register and the LGA TB register. All the patients interviewed confirmed the information as recorded in their treatment cards. Conclusion: The study revealed that NTP data in Southern Nigeria is fairly reliable; however, there are variations observed among the states and at various levels. This study underlines the need to improve TB surveillance data in some states, particularly at the facility and at the LGA levels. Background: Systemic antibiotics account for more than one third of all prescriptions for children; hence, antibiotic prescriptions for children lead to major public health concerns. Moreover, data regarding rational antibiotic use in children are very limited. Hence, it is essential that the antibiotic prescribing pattern be evaluated periodically to determine the rationality of its use and cost. Objectives: The aim of our study is to identify the prescribing pattern and to carry out the cost-identification analysis of antibiotic use in the patients admitted in the pediatrics department of a tertiary care hospital in North India. Materials and Methods: The study was conducted for 2 months in the pediatric ward and intensive care unit (ICU). The data regarding patient demographics and antibiotic use were collected daily in a structured pro forma. A descriptive analysis of the data was done. Results: A total of 191 patients were enrolled, most of them belonging to the age group of 2-14 years. Majority of the patients were males (75.9%). 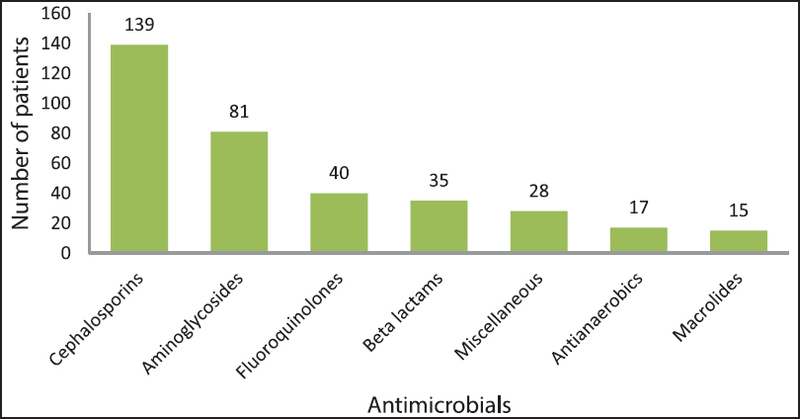 On an average, 1.9 antimicrobial agents (AMAs) were prescribed per patient. The most common AMAs prescribed were cephalosporins followed by aminoglycosides. The preferred route of administration was parenteral (92%). The average cost of treatment per patient was estimated to be `3,338. The percentage of drugs prescribed by generic name was 58%. Conclusions: Since our hospital is a major referral center of the state, newer generation of antibiotics are more commonly prescribed here. Hence, the cost of therapy is high. This baseline study will help in formulating an antibiotic policy and the standard treatment guidelines (STG) for appropriate use of antibiotics. Background: Posterior reversible encephalopathy syndrome (PRES) is a clinico-radiographic syndrome of multiple etiologies. Still, the exact pathophysiology of PRES is not clear. Aims and Objectives: To study demographic, etiological, and clinic-radiological profiles of patients presenting with PRES and their outcome at the tertiary care teaching hospital. Materials and Methods: A retrospective observational and non-interventional study was conducted at tertiary care center in from January 2009 to December 2013 at Krishna Institute of Medical Sciences, Karad. Inclusion Criteria: The clinical history of acute neurologic change including headache, encephalopathy, seizure, visual disturbance, or focal deficit with magnetic resonance imaging (MRI) brain imaging findings of focal vasogenic edema with clinical or radiologic proof of reversibility. Results: Of a total 43 patients with suspected diagnosis of PRES, 29 patients were included fulfilling all inclusion criteria of PRES. Of total the 29 patients with confirmed diagnosis of PRES, 22 (75.86%) were female and 7 (24.13%) were male patients, predominated by female population (relative risk [RR]: 3.14; odds ration [OR]: 9.87; 'P' < 0.001). The overall mean age was 33.65 years (±15.26) and mean duration of stay was 10.13 days (±4.98). The most common clinical presentation was generalized tonic-clonic seizures, seen in 23 (79.31%) patients, headache in 21 (72.41%) patients, and visual disturbances 13 (44.82%) patients. A total of 18 (62.06%) patients were hypertensive and 11 (37.93%) were normotensive [RR: 1.63]. A total of 6 (27.27%) females and 5 (71.42%) males were normotensive and total 16 (72.72%) females and 2 (28.57%) males were hypertensive (RR: 1.12). Of a total of 22 female patients with PRES, 19 (86.36%) were in a postpartum state, one (4.45%) had systemic lupus erythematous (SLE), one (4.54%) had community-acquired pneumonia (CAP) with acute respiratory distress syndrome (ARDS) with septicemia and one (4.54%) had chronic hypertension in accelerated phase. Postpartum state was significantly associated with PRES ('P' < 0.001). A total of 15 (68.18%) female patients had pregnancy-induced hypertension (PIH)/eclampsia. Of a total of 7 male patients with a diagnosis of PRES. two (28.57%) were had chronic kidney disease (CKD), two (28.57%) had chronic hypertension, one (14.28%) had alcohol intoxication, one (14.28%) had rheumatoid arthritis (RA), and one (14.28%) had septicemia with septicemic shock. Of a total three (10.34%) deaths, two were females (6.89%) and one (3.44%) was male. Total 26 (89.65%) patients were discharged after successful treatment. A total of three patients succumbed during treatment with case fatality rate of 10.34% (RR: 1.06). The most commonly involved location was the parieto-occipital and cerebellum brain region, which was seen in 23 (79.31%) patients and the lesions were asymmetric in 27 (93.10%) and symmetric in 2 (6.89%) cases. All 29 (100%) patients had bilateral affection. Conclusion: The present study revealed the significant numbers of patients in postpartum state with PRES syndrome with good prognosis. The present study highlighted affection of young, female population with history of hypertension with predominant affection of parieto-occipital and cerebellar involvement in PRES. Autoimmune disease, infection, alcohol intoxication, and CKD were less common factors associated with PRES. The history of hypertension in clinical scenario with neuro-imaging, we should consider the possibility of PRES and aggressively treat based on the clinical presentation. Brain imaging plays an important role in diagnosis of PRES. The early diagnosis, prompt treatment including maintenance of hydration control of blood pressure and seizure and removal of precipitating factors is mandatory for a good outcome of PRES with minimal or no residual neuro-deficit. Background: Chronic kidney disease (CKD) is now a public health burden. If simple screening tests like the glomerular filtration rate (GFR) and presence of albuminuria are done in asymptomatic persons, CKD can be diagnosed earlier that will help in halting the disease and not let it progress to end-stage renal disease (ESRD). Aim: This study was conducted to see the proportion of renal function abnormality in the relatives of CKD patients. Settings and Design: This was a cross-sectional comparative study conducted at Chittagong Medical College Hospital (CMCH), Chittagong, Bangladesh, a tertiary hospital in the southern part of Bangladesh. Materials and Methods: We screened the relatives of CKD patients, as a risk population, by urine albumin and estimated GFR (eGFR). Results: We observed a significant difference in urine albumin (29% vs 10% in relatives and nonrelatives, respectively) and abnormal renal function [albuminuria/creatinine clearance (CCr) criteria] (30% vs 11% in relatives and nonrelatives, respectively) between relatives and nonrelatives. Relatives of glomerulonephritis-CKD (GN-CKD) patients had more albuminuria than others. Risk factors like hypertension (HTN), impaired glucose tolerance (IGT)/diabetes mellitus (DM), and family history of DM/HTN/cardiovascular disease (CVD) were significant among relatives and might have some link to familial influence on developing CKD. Conclusion: Relatives of CKD patients should be screened as a risk population to evaluate abnormal renal function. Background: The clinical profile of dengue fever (DF) is changing and neurological manifestations are being reported more frequently. The exact incidence of various neurological complications is uncertain. Objectives: The aim of this study was to observe the neurological manifestations in dengue infection. Materials and Methods: In this prospective study, 263 confirmed cases of dengue infection were observed for neurological complications. Detailed clinical examination and investigations were done to detect any neurological involvement in dengue infection. Result: In this study, neurological complication was seen in 8.3% (22/263) of patients. The most common neurological manifestation was seizure, seen in 54.54% (12/22) of cases, followed by encephalopathy and meningitis, each of which was seen in 18.18% (4/22) of the cases. The other manifestation was intracerebral hemorrhage, seen in 9.09% (2/22) of cases. Conclusion: The study findings could potentially be explored for a better understanding of neurological complications of dengue infection in endemic areas. Pneumocystis jirovecii pneumonia (PCP) is a potentially life-threatening infection, which predominantly occurs in the immuno-compromised host. It has been rarely reported in immunocompetent subjects. In them, the infection presents with fulminant respiratory failure along with fever and dry cough in contrast to an indolent course in the immuno-compromised population. The most significant risk factors for PCP in non-HIV infected hosts are glucocorticoid use and cell mediated immunity defects. 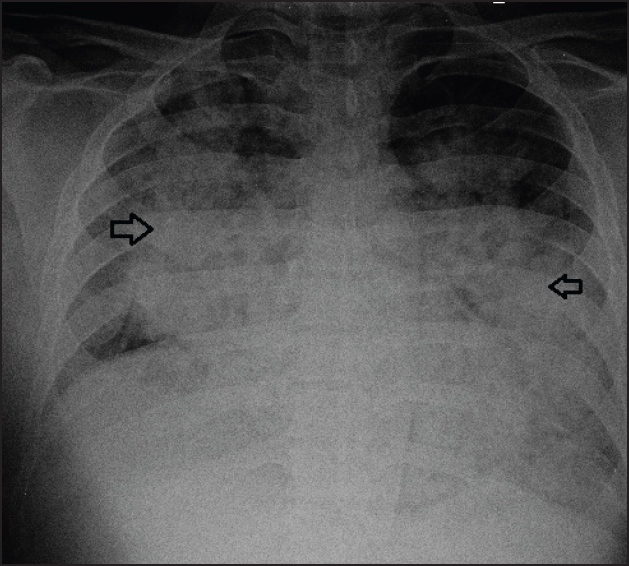 We report a rare case of Pneumocystis jirovecii pneumonia in an immunocompetent patient. Hydatid cyst is a parasitic infestation. It most commonly involves the liver, followed by the lungs. The kidney is rarely involved. Characteristically, it presents as a multiloculated cyst with daughter cyst(s) on imaging. 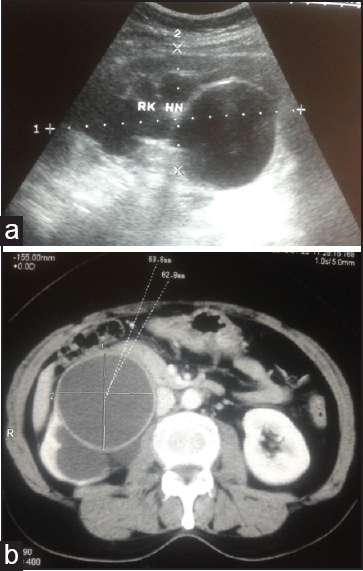 We present a case diagnosed as simple renal cyst found to be a hydatid cyst on exploration. A 50-year-old woman presented with right flank pain without hematuria or lower urinary tract symptoms (LUTS) for 6 months duration. On ultrasonography, a 6 cm × 7 cm simple cyst at the parapelvic location with hydronephrosis was found. Contrast-enhanced computed tomography kidney, uterus, bladder (CECT KUB) showed a large noncommunicating cyst of dimension 79.3 mm × 63.6 mm × 62.8 mm with a thin smooth wall compressing the pelvis, causing hydronephrosis. On exploration, a daughter cyst within the hydatid cyst was found. All of the fluid was drained, and then the ectocyst was removed. There was no communication between the cysts and the pelvicalyceal system. Sexually transmitted infections have become a major public health problem in the global scenario. Use of contraceptives such as condoms can prevent exchange of body fluids thereby preventing transmission of certain sexually transmitted infections, however many other sexually transmitted infections gets transmitted through direct body contact. Pediculosis pubis is an uncommon sexually transmitted infection caused by the obligate ectoparasite Phthirus pubisor Crab lice. This case report of a 21 years old male patient who presented with submandibular lymphadenopathy and multiple erythematous macules on his face, chest and pubic region. He gave a history of multiple sexual exposures. Further examination and investigations revealed it to be a case of Pediculosis pubis. This parasite was collected, examined macroscopically, microscopically, and morphologically identified as Phthirus pubis. Tuberculous meningitis is the most common manifestation of neurotuberculosis. The incidence of spinal intramedullary tuberculoma is still an uncommon presentation even in a country like India, where the burden of tuberculosis is high. A combination of intramedullary, cerebellar, and cerebrum tuberculoma is rare. We report a case of symptomatic cervical and dorsal intramedullary tuberculoma without bladder involvement and asymptomatic cerebellar and temporal lobe tuberculoma. We admitted a case of dengue fever who was positive for dengue serotype 2 in the Department of Medicine, King George's Medical University (K.G.M.U. ), Lucknow, Uttar Pradesh, India. The patient had developed erythematous rashes with thrombocytopenia and bleeding manifestation in the form of microscopic hematuria. While he was recovering from the illness, he developed a sudden onset of breathlessness. 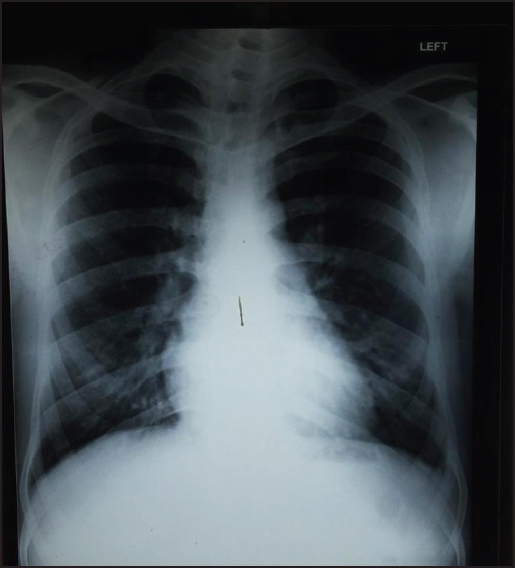 On examination, his chest was full of crepitation bilaterally and his x-ray was suggestive of pulmonary edema. His troponin T (Trop T) and prohormone brain natriuretic peptide (proBNP) levels were elevated. Two-dimensional echo showed global left ventricular (LV) hypokinesia with mitral regurgitation (MR) and tricuspid regurgitation (TR). A diagnosis of myocarditis was made and the patient was managed in an intensive care unit (ICU) setting. The patient recovered from the illness and after a follow-up period of 6 weeks, showed no residual cardiac abnormality. Microorganisms possess many virulence factors that are usually decided by their genetic makeup. Not many virulence determinants of bacteria are phenotypically expressed. Capsule is one such bacterial organelle, which displays many functions that include adherence, resistance to immune clearance, protection against environmental factors, and many others including the typing of bacteria based on their specific capsular antigen and rapid diagnosis of capsulated bacterial infections using monoclonal/polyclonal anticapsular antibodies.